The saguaro cactus (Carnegiea Gigantea) is the state symbol of Arizona, appearing on all car license plates, and provides a universally recognized image of the Southwest. It is the largest and one of the slowest growing of all cacti, reaching up to 15 meters high and living for several centuries. Plants can weigh up to 8 tons, partly because of the large amount of water the stems can hold - after rainfall the cactus can absorb hundreds of gallons in a short time. The saguaro may be only 6 inches high after 10 years, and the characteristic branched appearance is reached only after around 80 years. The cactus is widespread across southern Arizona, extreme southeast California and Sonora, north Mexico - see map below. Distribution is related to latitude and altitude - it is most commonly found between 1,000 & 3,000 feet, and because the saguaro can tolerate temperatures as low as 24°F (-4°C), it survives further north than any of the other species of large cactus. In the spring, the saguaro produce white flowers on the upper stems of mature plants so this is an especially good time to visit. Later, sweet edible red fruit appear, traditionally used by the local Indian tribes as food and also to make wine. 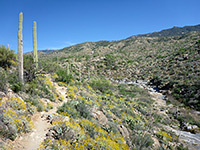 There are many densely forested regions in the Southwest but two areas of the Sonoran Desert either side of Tucson have been selected and preserved as Saguaro National Park - the Tucson Mountain (west) and Rincon Mountain (east) districts. 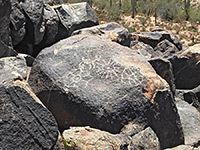 The park was upgraded in status from a national monument in 1994, and besides the ever-present saguaro, also preserves a large variety of other cacti and desert plants, plus much interesting wildlife, although the majority is only active during the night. Of the two regions of the national park, the western section is about half plains, and half mountains, up to 4,687 feet (Wasson Peak), and is generally more visited than the larger eastern section, of which a relatively small area is flat lowlands, crossed by most of the trails; the majority of the land is higher ground, including several peaks over 8,000 feet. The general character of the two sections are similar, however, and a visit to either is just as rewarding. Organ Pipe Cactus National Monument also has many saguaros, together with other more unusual columnar cacti, and is more remote and less visited. 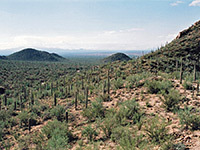 There are no campsites within Saguaro National Park but a selection of hotels in nearby Tucson and Marana. One of the closest to the west section (14 miles from the visitor center) is Holiday Inn Express Hotel & Suites Tucson. This is located just northwest of downtown Tucson, and 0.4 miles west of exit 256 of I-10, at 1564 W Grants Road - part of a complex at the corner of Grants and N Dragoon St. The front of the hotel overlooks the (usually dry) Santa Cruz River. The hotel is also close to other nearby attractions including Old Tucson Studios, Silverbell Golf Course and the Tucson Convention Center. Other nearby hotels: Marana, Tucson (west/central), Tucson (north) - follow the links for maps and hotel descriptions.